Moroccan oil is very common and prevalent to Morocco as the Moroccan people have been using it for centuries. Scientists were able to discover its true value and claims are proven to be true through research and studies. 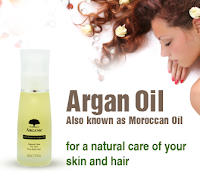 It is oil produced from the argan tree, valued for its numerous nutritive, cosmetic and medicinal properties. The pure argan oil remains one of the rarest oils in the world due to the small and very specific growing areas. Through the years more and more women favor its versatility and usefulness being rich in antioxidants and essential fatty acids. The following are the reasons why most women and men alike choose the Argan oil. Combat and reduce normal signs of aging. It can diminish fine lines, uneven skin tone and dullness. With repeated use it helps heal damage skin, dehydrates and corrects skin elasticity during pregnancy. With regular application, it prevents and controls the appearance of stretch marks. It also lessens the appearance of wrinkles, acne, scars and free radicals bringing a softer and smoother skin. It alleviates symptoms of rheumatoid arthritis. An argan oil massage eases the restless leg syndrome and relieves muscle cramps and the breakout of varicose veins. Notable for repairing damaged and dry hair – the vitamin E and fatty acid content helps the hair to become stronger and healthier looking in just a drop for a continuous usage. It can treat dandruff and hair loss which is the most frequent hair problem. Makes the nails less brittle and stronger, as the oil is quickly absorbed into the nail beds it gives enough nutrients to make them sturdy. No more worries for growing long beautiful nails. The argan oil is rich in anti-oxidants and nutrients, its capability of revitalizing and nourishing the hair, nails and skin without any harmful effect is the wonder that’s why this fantastic oil is so well-loved.